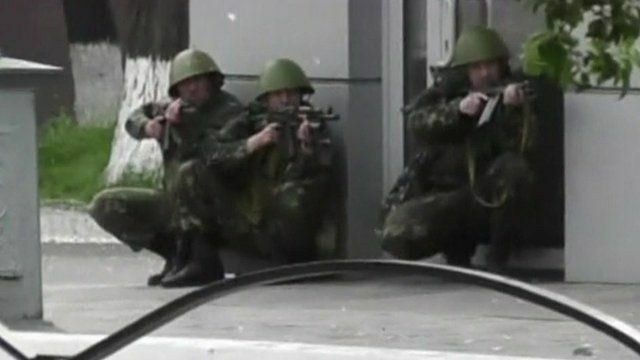 'Blood bath' in Mariupol Jump to media player At least seven people have been killed in the eastern Ukrainian city of Mariupol in fighting around police headquarters. Kiev's young professionals on conflict Jump to media player As fighting continues in the east of Ukraine, young professionals are getting on with their lives in Kiev. But the conflict is not far from their minds, as David Stern reports. Putin 'backs' Ukraine election Jump to media player Russia's President Vladimir Putin has said Ukraine's presidential election on 25 May is a step "in the right direction". East Ukraine rebels back referendum Jump to media player Pro-Russian activists in eastern Ukraine have decided to go ahead with an independence referendum on Sunday, despite a call from Russian President Vladimir Putin to postpone it. 60 secs: Ukraine v Russia militaries Jump to media player BBC News compares the military strengths of Ukraine and Russia, in 60 seconds. Tear gas and gun shots in Ukraine Jump to media player The BBC's Sarah Rainsford reports from Mariupol where pro-Russians groups are occupying a key official building. At least seven people have been killed in the eastern Ukrainian city of Mariupol. The government says its troops responded when activists tried to take over the police headquarters. Most of the dead are thought to be pro-Russian activists. The BBC's Richard Galpin spent some of the day in Mariupol.